My first mooncake! I thought I should start off with something easy before venturing into something tougher like baked mooncake. I'll however make the baked mooncake when Mid-Autumn Festival is nearer! Just made the golden syrup a month back. Let it mellow for as long as possible. It would also be less sticky and easier to handle if we leave it for a long time according to Aunty Yochana! Anyway, I used Aunty Yochana's Bird's Nest Custard Filling Snowskin Mooncake as a guide. 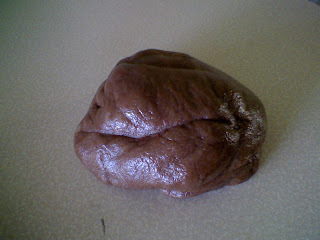 I used the same skin and added in 2 tbsp cocoa powder along with the dry ingredients. As for the fillling, I added in 300g of fresh durian meat and stir it into the mixture before cooking it over stove and towards later, steaming it. I chilled it in the fridge overnight and easily form it into 30g balls. Same goes to the skin too. 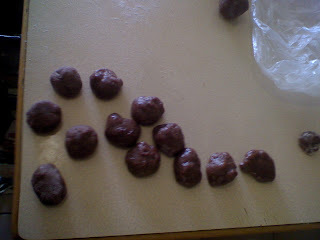 I formed them into 30g balls too. They were quite sticky at the beginning but gets easier to work with as time goes by. 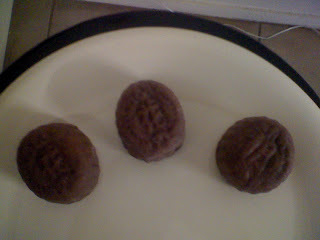 I wrapped the filling into the skin and roll them into round balls before pressing them into the mould Aunty Yochana got me. Yes, you heard me right. Aunty Yochana took all the trouble to post it to me all the way to the land of Kangaroos from Singapore. Somemore refuse to accept my money and ask me to treat it as a gift from her. But of course I'm too shy to take it for free and I paid her 10dollars for the postage and the moulds. 3 of them altogether. Thanks again Aunty Yochana! I didn't do a good job. 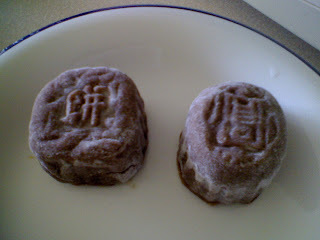 You could see that the filling were pretty uneven at the bottom of the mooncake. I press them into the mould and pinch out the excess. Hence the filling sorta got pinch off as well. Also, I didn't use Crisco shortening. God knows why it is so hard to find shortening in Australia. I substituted with vegetable oil. I read somewhere it is okay to do so. The skin was pretty tasty and not oily at all while we were eating the chilled well mooncakes. All in all, it was a good first try for me. A lot of work though. I better be more prepared next time when I'm making the baked mooncakes next time. 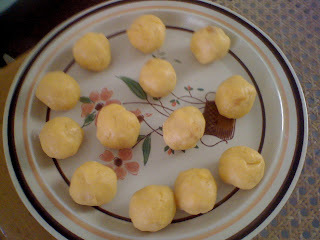 I have a little durian left from making durian custard puff and a kilo of yogurt. Planning to make durian yogurt muffins or maybe yogurt durian jelly mooncakes! We'll see how it goes if I could find some time! 0 comments on "Durian Custard Filling with Chocolate Snowskin Mooncake"